Empirical analyses on inequality measurement and those in other fields in economics and finance often face the difficulty that the data is correlated, heterogeneous or heavy-tailed in some unknown fashion. 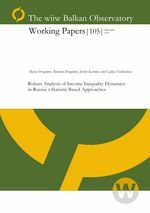 The paper focuses on analogues and modifications of the recently developed t-statistic based robust inference methods that are applicable in the analysis of income and wealth distributions and inequality measures. The methods can be used under general conditions appropriate for real-world markets and have several advantages over other inference approaches available in the literature. We illustrate the use of the robust inference approaches in the study of important problems with pronounced complications for alternative econometric procedures focusing on the analysis of income distribution and inequality in the Russian economy where heterogeneity, outliers and crisis effects are expected to be present. Among other results, the paper provides robust confidence intervals for the Gini coefficient in Russia in the periods before and after the beginning of the on-going crisis. The results considerably complement the point estimates of the Gini coefficient for the Russian economy available in the literature. They further point out to significant changes in income inequality and redistribution of income in Russia prompted by the beginning of the on-going crisis in 2008. In addition to the above results, we also present characterizations of the whole income distribution in Russia using double Pareto models recently introduced to the field. The empirical results for double power-law models for Russian income distribution point out to its significant heavy-tailedness and provide further motivation for the development and applications of robust approaches to inference on income distributions, inequality measures and their dynamics and structural changes, both in emerging and transition economies and developed markets.